Happy Birthday Sarah!! Today Sarah celebrates and turns 11-years old! In honor of my cousin Sarah, I thought I’d share with you her delicious pumpkin muffins. When we were in Houston last week, my Aunt Jolene had made a batch of Sarah’s pumpkin muffins for Harper and I. Jolene actually doubles the recipe so she can use the whole can of pumpkin rather than throwing half the can away in the trash. Quick breads and muffins freeze well, so I’d suggest doing the same and freezing the leftovers if you can’t eat them all. Sarah is Jolene’s 11-year old granddaughter and my cousin, and is sweet as can be. She loves playing with Harper and is the kind of person who would do anything for you. She is selfless and so giving, and at age 11, that is rare. Sarah got this recipe from summer camp at Camp Ozark. 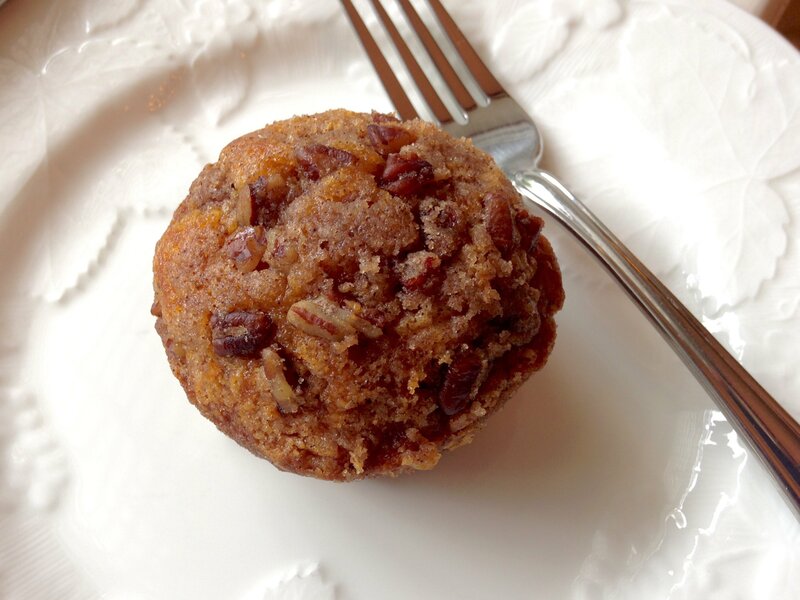 They served these pumpkin muffins there and she loved them so much, that she sought out the recipe for them. The recipe happened to be in a cookbook they sold at the camp gift shop! Now Sarah makes these muffins all the time and we love them. While Sarah doesn’t make these pumpkin muffins with a topping, you can add one if you wish. Jolene googled a cinnamon-sugar pecan streusel topping and added it to these muffins for a little extra sweetness. They are to die for!! If you want to go the healthy route, leave off the topping, but if you want them a little more decadent, feel free to add it! 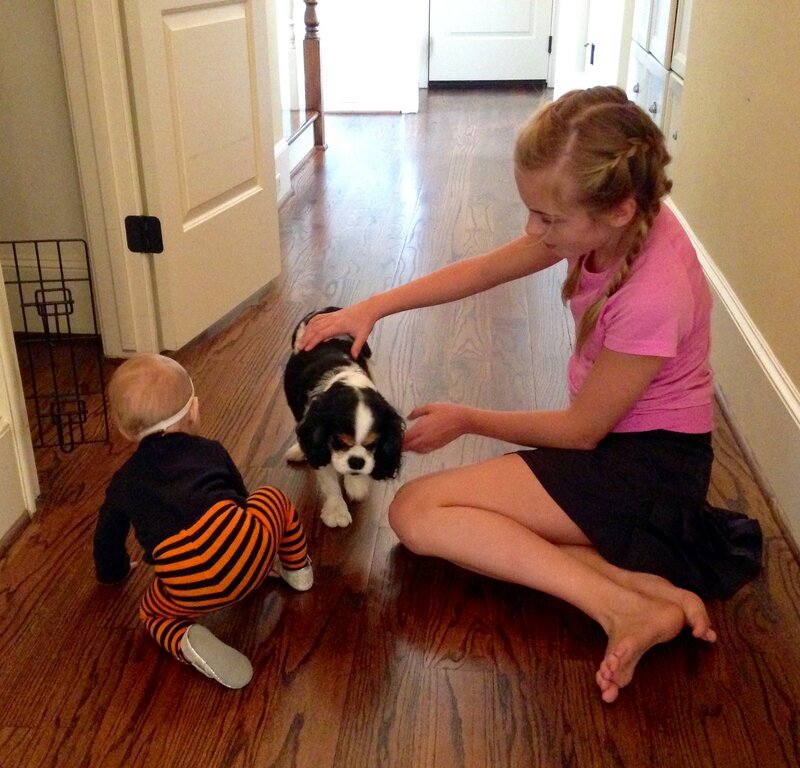 Harper loves dogs, and enjoyed playing with both Sarah and Sophie, a King Charles spaniel. Harper loves walking. 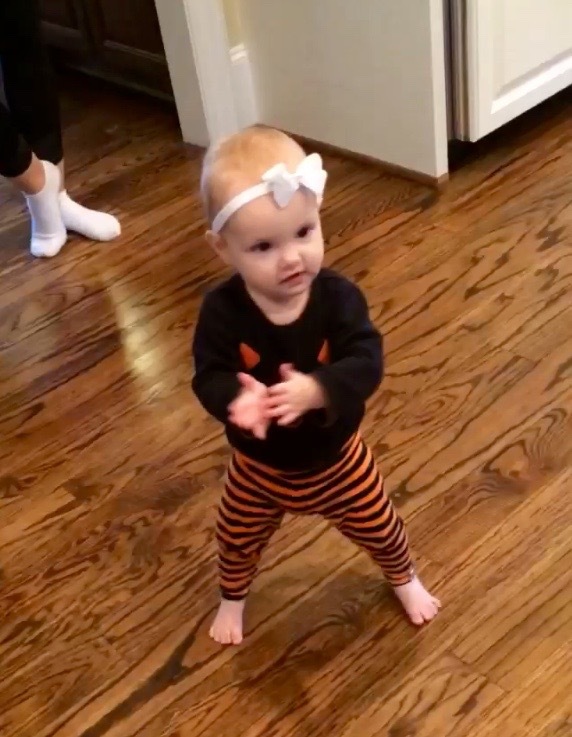 She even claps at herself while walking! Preheat oven to 350 degrees F. Spray a standard muffin tin with nonstick spray. In a large bowl, sift together flour, soda powder, salt, cinnamon, nutmeg and cloves. In a separate bowl, mix together pumpkin, sugar, oil, eggs and vanilla until blended. Add wet ingredients to flour mixture. Pour batter into prepared muffin tins and bake for 20 minutes or until a toothpick comes out clean. 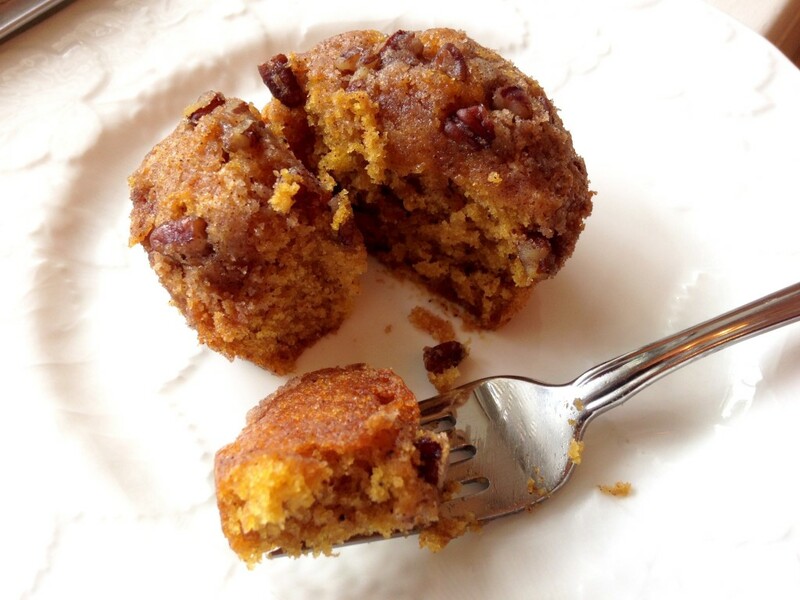 One Response to "Sarah’s Pumpkin Muffins"
I’m just now looking at this……..looks so good! Happy birthday to Sarah too. 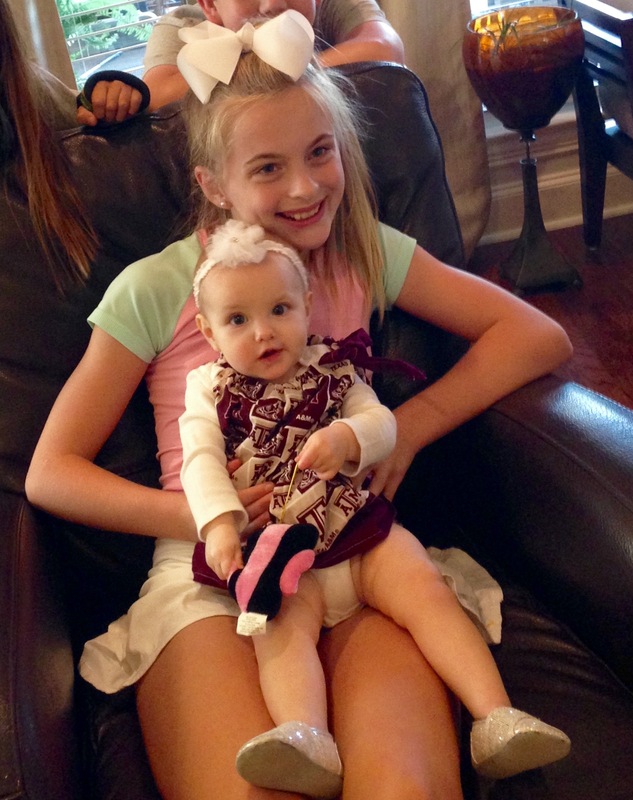 The pictures of her and Harper are sweet …..just like both of them.